There’s a sweet spot to every military duty station, when you've lived in the same place for one or two years and you finally start to feel adjusted. You can find your way to the grocery store without a GPS. You have a favorite restaurant or spot to get together with your friends. You can share "insider information" with a newcomer about where to go or how to get a good deal. All of these are signs that you are no longer a tourist passing through the area. You are settled and living like a local! The difference between living like a tourist or living like a local is difficult to describe. A tourist tries to hit all the main attractions as quickly as possible, since they will spend limited time in the area. A local has experienced the ebb and flow of seasons. They have favorite locations, because they have taken the time to explore and make mistakes. They have experienced annual celebrations or traditions. Military families can enjoy the local lifestyle too, even if they aren’t from the area. Military life can take you to some interesting places. To be sure, some bases are much less interesting than others. But every base and its surrounding towns have something to offer, even if they don’t appear in any top tourist destination books. 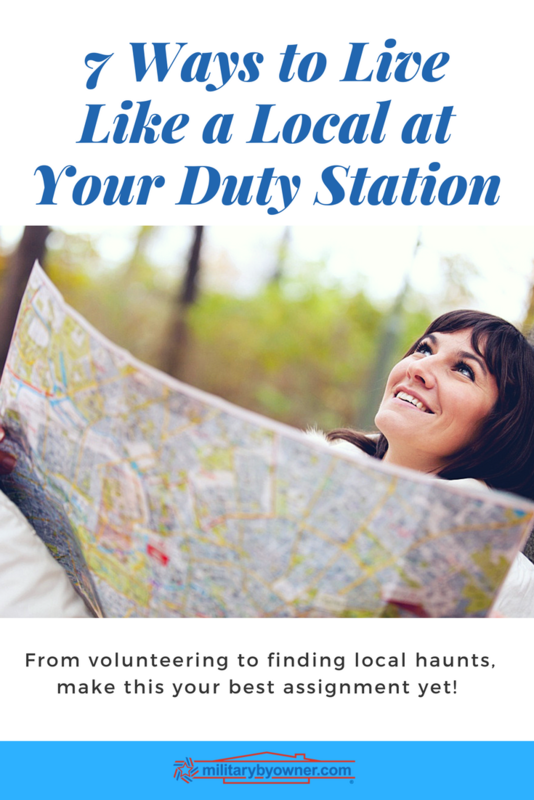 When you get to a new duty station, try to adjust to local life as quickly as possible. You can do this whether you live on or off base. Here’s how. 7 ways to feel like a local, even when you’re new in town. 1) Find a favorite restaurant. If you’re stuck in a hotel during your PCS move, add variety to your meals by trying new places. Avoid the chain restaurants you can find anywhere in the country. Instead, head downtown to a small hole-in-the-wall. These dives sometimes have incredible food, and are a great way to discover what the locals like. When the owner recognizes you and saves you a table each weekend, you are officially a local. 2) Go to festivals and parades. Annual celebrations are usually a local affair, sponsored by the town. Whether it’s the summer fair, a tractor parade, or an apple pie festival, these local events can be fun for the whole family and give you a great taste of your new home. In a military town, you can expect major celebrations for Memorial Day, the 4th of July, and Veterans Day. 3) Try new food and recipes. When we were stationed in North Carolina, we learned a lot about BBQ and Southern cooking. In California, it was all about fish tacos and guacamole. And when we lived in Europe, we sometimes pointed to unknown menu items and hoped for the best! At every duty station, we have been pleasantly surprised by local dishes. Challenge yourself to try local specialties at least once. They may turn out to be better than you expect. 4) Go to the parks. No, not the big amusement parks. Head into nature with hiking trails, bike paths, local playgrounds, or picnic locations. Check out the state and national parks near your duty station for the best views and some unique experiences. Whether you are a fitness fanatic or need a slower pace for small children, you can find parks that will be a breath of fresh air for the whole family. 5) Join a class or club. You know what tourists don’t do? Sign up for fitness classes at the YMCA. Or register their kids for the community center art class. Or join a book club. Use your hobbies to connect you to the local community. Not only will you find people who enjoy the same thing as you, but you can start making friends who aren’t connected to the military base. Another great way to connect to your local community is to volunteer with a project or organization that is important to you. Whether you love walking dogs, playing sports, or reading books to children, there are surely local organizations that will value your time and your talents. When you become a regular volunteer, you will feel like you are putting down roots at your new location. 7) Talk to the locals! During all of the above activities, be sure to strike up conversations with the people around you. Locals have a wealth of information about the best places to go and the most exciting activities in the area. Ask for their advice. Accept their invitations. You never know when a casual conversation at your kid’s dance class will turn into a long friendship.